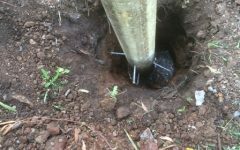 How to protect timber fence posts from rain and ground water is important to the long life of a fence. Often customers comment that their hardwood or treated pine posts have rotted of at the base of the post. Despite treatment it seems treated pine posts eventually rot if in contact with water for extended periods. What goes wrong? 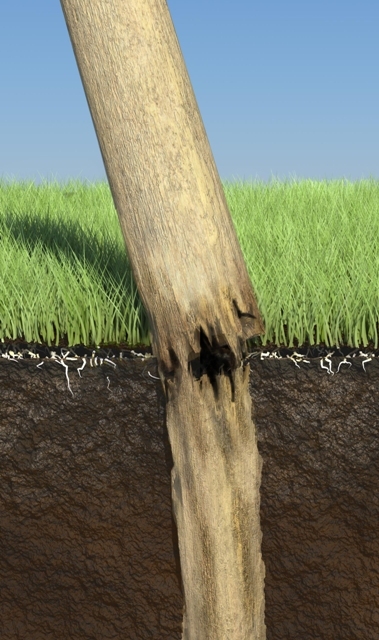 Why do timber posts rot? There are many reasons which include poor quality materials and ineffective timber treatments. But we want to cover an installation error that often occurs. When post holes are dug with a shovel or auger, the disturbed soil is less compact than the surrounding soil. The hole then can become like a pond. Heavy soils like clay can hold this water for an extended period. Rain will run down the face of the post and the water will settle in the softer soil at the base. (Also ground water will run along compact soil until it finds some soft soil to dam up in at the base of your post). Thereby the timber post is left sitting in a pond of water. Note if there is concrete in the bottom of that hole this might prevent the water draining down deeper into the soil. In our drawing, below, the post on the right highlights how a pond might be formed. The post on the right will suffer from water being held at its base. Note: The dimensions used here are just to highlight the issue, in practice the hole dug for a fence post should be kept as small as possible. 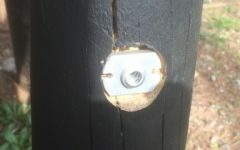 Protect timber fence posts with a simple installation tip. 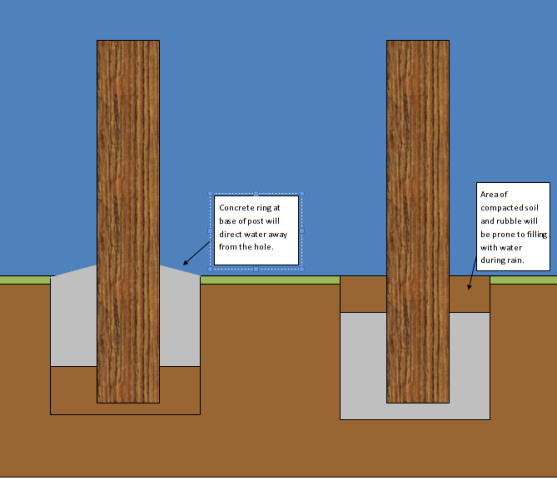 To overcome this issue use a concrete ring at surface level to direct water away from the base of the post and away from the hole. Also note that the very bottom of the hole is filled with compacted soil and rubble. This will allow any water that does makes its way to the base of the post to drain away. 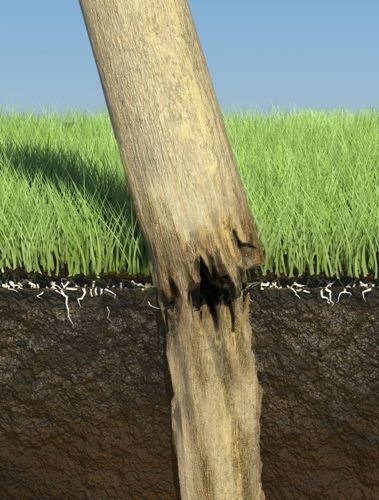 Obviously moist soil will impact the life of a timber post. This method can only prolong the life by diverting as much water away as possible. For further ideas see our other blog on install timber fence posts.